Kolokotes (singular kolokoti, pr. 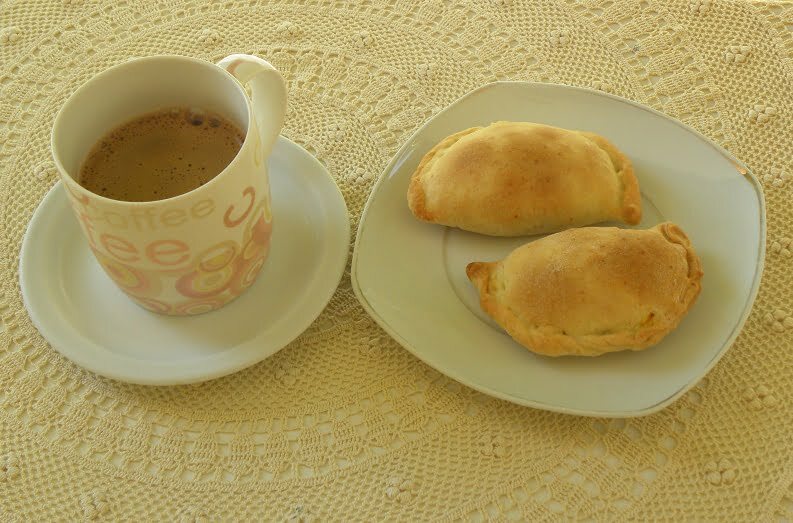 Koh-loh-ko-TESS), are traditional Cypriot pastries, similar to turnovers, calzone, empanadas, boureki or pies, made with squash or pumpkin. They are neither sweat or salty. They can be eaten any time of the day. Try them for breakfast with a cup of milk or as a snack with a soda or as a snack in the evening with a glass of wine. Anyway you try them they are delicious. When I used to live in Cyprus, they used to be sold by street vendors but now you can find them in any Cypriot bakery as you rarely see street vendors. In the Greek language there is only one word for pumpkins, squash or courgettes (zucchini) and the word is “kolokythi or kolokytha” or “kolodji” in the Cypriot language, so this is where it takes its name from. These Cypriot turnovers are filled with squash or pumpkin, nuts, raisins and spices. (In the picture, those with a toothpick on the side are without raisins as a family member does not like them!!). Bulgur or rice is added in the filling and this is to absorb the juices of the squash / pumpkin. Carolina rice, is a Greek variety of rice which is starchy, so you can replace it with any rice suitable for risotto or rice pudding. They are vegan and perfect for Lent, especially for breakfast or as a snack, with a cup of coffee or with a glass of wine. If you are not vegan, you can brush them with egg wash (1 egg yolk, dissolved in a few tablespoons of milk or water). My mother used to manually cut the pumpkin into small cubes and I used to do this as well for many years but now as my mixer has an attachment which shreds vegetables this is much easier to do. Prepare the dough and let it rest for half an hour. (See video how to make homemade phyllo by hand or using the pasta maker). Peel the pumpkin and remove the seeds and threads preferably with a spoon and cut it into small cubes (about 1 cm) or shred it in your food processor. Put it in a bowl together with the rice (or bulgur wheat), sugar, olive oil, almonds, raisins, fennel fronds and the spices and mix. Roll out your dough and stop before your phyllo becomes transparent. Place a small plate of about 15 cm (6 inches) diameter on the phyllo and cut round circles. On one side place a spoonful of the filling and cover with the other half. Press gently to join the two edges. Take both sides and turn up pressing with fingers so as to crimp the dough. Place them in an oiled baking tin or on parchment paper and brush them with olive oil, orange juice or with egg wash and bake them in a preheated oven to 180ο C / 350o F, for 30 minutes or until golden on top. This and many Cypriot recipes are included in my cookbook Mint, Cinnamon & Blossom Water, Flavours of Cyprus, Kopiaste as well as in Volume 2 of my e-cookbook, sold on all Amazon stores. My second cookbook “More Than A Greek Salad” is also available on all Amazon stores. For more information here. My mother used to add fennel fronds in it and it gives it such a nice taste. However, if I can’t find fennel I prefer not to add any other herbs. Thanks for commenting. Happy New Year.